The Australian cruise deal and travel guide with lots of cruise ship information. Home / Cruise Ships / Are Cruises Safe? The vast oceans and waterways of our planet are mysterious and awe-inspiring, but mother nature is a force more powerful than ourselves, and the oceans deserve respect. It’s human nature to adjust the natural balance for our own purposes, whether it means flying in the sky, hurtling down a motorway, or cruising the seven seas, which leads to the question: are cruises safe? There are numerous regulations in place to provide a safe environment, both for passengers and crew. Ongoing and regular inspections of cruise ships is essential to ensure the crew and ship can respond to emergency situations. Vessels comply with international Safety of Life at Sea (SOLAS) rules to ensure safe navigation, ability to respond to fire and react to security threats. Prior to sailing, cruise ship staff provide a safety drill for all passengers to familiarise them with the vessel. The drill is a basic safety measure for everyone, and includes locating emergency lifeboats and life jackets. However, despite the best intentions of engineers and ship’s crew, accidents do occasionally happen, sometimes with tragic results. Fortunately, occurrences such as a cruise ship capsizing or catching fire are extremely rare, especially when we consider the number of ships and the millions of people who cruise yearly. The cruise industry is constantly refining safety measures and procedures. After all, passengers are the lifeblood of the cruise industry, and provision of a safe cruising environment is essential in order to attract customers. 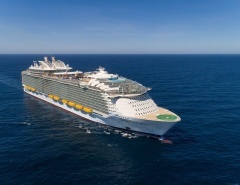 The Cruise Lines International Association implemented a passenger bill of rights for the cruise industry, designed to guarantee safety, care and comfort. There are also guidelines governing passenger fare refunds in cases of mechanical failure or other situations where the voyage is terminated. 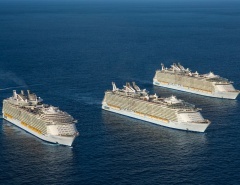 Actually, when safety is evaluated, cruising compares very favourably with other forms of travel. The cruise industry has grown enormously, with passenger numbers rapidly rising during the last couple of decades. The passenger numbers are indicative of satisfaction of cruisers regarding safety, along with the all-round fun and adventure of the cruising experience. The global cruise industry anticipates that 24 million US passengers will cruise in 2018, with overall revenues of close to 40 billion US dollars. There are about 2,000 cruise ship embarkation ports around the world, and the annual growth rate for the cruise industry since the 1980’s has been over 7 percent. Of all vacation styles, cruising is promoted more often by word of mouth compared to flying or driving holidays. 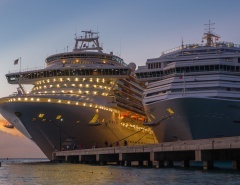 The dramatic increase in cruise passenger numbers indicates extremely positive feedback and recommendations by former passengers, alongside global marketing and advertising in a very competitive industry. Once onboard your cruise ship however, it’s important not to become complacent regarding safety and security. After all, a cruise ship is in some ways similar to a land-based resort or small town. Some vessels carry more than 5,000 passengers, and the potential for crime is apparent. The cruise industry has responded to concerns by making cruise ship crime data accessible. Companies are also constantly upgrading onboard surveillance systems and raising the qualification levels for cruise ship security personnel. Safety and security is taken seriously on cruise ships, and serious crime incidents are reported and dealt with by standard legal procedures. Government authorities are informed in order to apprehend and charge offenders on the rare occasion a serious crime is committed. There are also external factors that influence the legal course of action, such as nationality of the victim, location of the ship, country and flag of the ship and ports of embarkation and debarkation. Passengers need to ensure they are safe and valuables are secure at all times. Following basic security guidelines, just as anyone would at home, greatly diminishes the incidence of onboard crime. A degree of vigilance is required to establish a harmonious and friendly cruise environment. All crew and ship’s staff are expected to understand emergency protocol and procedures, ensuring a great time is had by everybody. Cruise ships, although enormous, are built inch-perfect to exacting specifications using only the best materials and technology available. The ships are constructed to easily withstand rough seas and unfavourable weather conditions. The possibility of human error in navigating a cruise ship is undeniable, though potential for mishap or accident has been greatly reduced with the use of technology. Loves cruise tips and cruise ships. Shares his personal opinion about cruise deals and cruise tips that might help other travellers. Do let me know if you'd like to read more about certain cruise related topics. 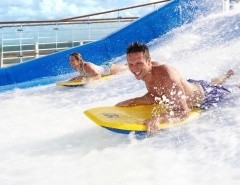 Which Cruise Ships Have FlowRider?